Those results, delivered with unprecedented precision from aircraft that put no American pilots at risk, may help explain why the drone campaign has never attracted as much scrutiny as the detention or interrogation programs of the George W. Bush era. Although human rights advocates and others are increasingly critical of the drone program, the level of public debate remains muted. Senior Democrats barely blink at the idea that a president from their party has assembled such a highly efficient machine for the targeted killing of suspected terrorists. 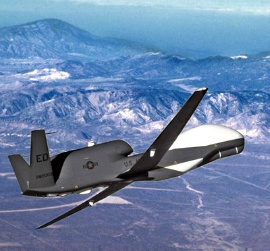 It is a measure of the extent to which the drone campaign has become an awkward open secret in Washington that even those inclined to express misgivings can only allude to a program that, officially, they are not allowed to discuss. ….Another reason for the lack of extensive debate is secrecy. The White House has refused to divulge details about the structure of the drone program or, with rare exceptions, who has been killed. White House and CIA officials declined to speak for attribution for this article. The two bolded passages have long struck me as key, underdiscussed issues. I remain convinced that manned fighters would attract far more attention than drones, and we’ve allowed ourselves to be lulled into indifference simply because of the video game nature of the drone program. This is reinforced by the fact that there’s essentially no partisan opposition any longer. Republicans are in favor of anything that kills more bad guys, regardless of collateral damage, and Democrats are unwilling to make trouble for a president of their own party. Put those two things together, and drones have become stealth weapons both politically and technologically. The truth is that I’m not sure what to think of all this. The bulk of the U.S. drone program has been in Afghanistan, where we’re fighting a declared war, and in Pakistan and Yemen, where drone strikes are carried out with the cooperation of the host country. (Though that may finally be ending in Pakistan.) But I wonder how long that will last. Somalia is next on the list, and an administration official tells Miller that it’s an inviting target not because the host government would cooperate, but because there’s basically no host government to worry about. That’s one more step along a slippery slope to simply using drones wherever we want because nobody is really paying much attention. That’s not a slope we should be happy to slide down.